Enjoy a festive online gambling site with PartyCasino. Choose from a number of online casino games including lucrative jackpots and live casino. PartyCasino also hosts a mobile platform so players can access games right from their smartphones or tablet devices. 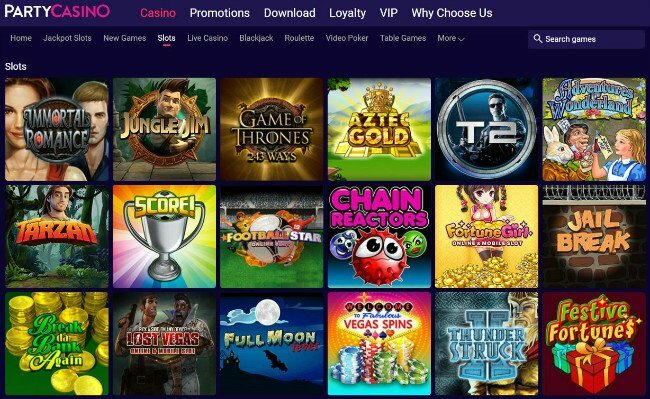 Expect quality gaming and a variety of payment options with Party Casino. After receiving a new look in 2017, PartyCasino (also known as Party Casino) offers a large variety of online casino games, Live Dealer games, and games for mobile devices. It takes a few minutes to download the casino software. However, once I got down to playing, I did find their games well worth the wait. You’ll find some really sophisticated 3D Graphics and unique themes. In addition, PartyCasino online rewards players with some of the most lucrative bonuses available. So start downloading the software, make a pot of coffee, and you’ll come back to the computer happy and ready to play. When I went to download PartyCasino software, it took a few minutes to install. Once I finally finished downloading the software, PartyCasino really impressed me with their game choices and graphics (re-branded and updated on June 2017). I loved the design and soundtrack of the games, especially Hippy Days and Dragon’s Hoard. They also allow players to multi-task and play more than one game at a time, thus increasing chances of winning. The cherry on top is definitely the large amount of jackpot slots available. Some of the jackpot pools reach over $1 million in cash! With PartyCasino, you can enjoy the real casino experience by playing Live Casino games including Baccarat, Blackjack, and Roulette. Play these classic table games and enjoy the thrill of anticipation as the croupier spins the Roulette wheel, shuffles the Blackjack deck, or deals you in a hand of Baccarat. In the age of smart phones, it’s essential that online casinos support mobile gaming. PartyCasino allows you to play your favorite games on the go such as Roulette and Blackjack as well as Melon Madness and other jackpot slots. PartyCasino is compatible with iOS and Android so you can enjoy all the thrills on your tablet or mobile phone. Once I finally finished downloading the software, PartyCasino really impressed me with their game choices and graphics. I loved the design and soundtrack of their games, especially Hippy Days and Dragon’s Hoard. 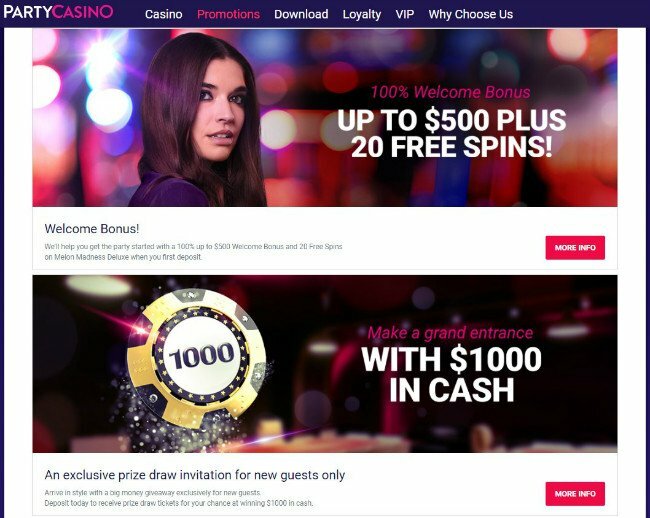 Join the Party – Get partycasino.com Promotions! In comparison with other online gambling sites, PartyCasino bonuses boast some of the most generous packages out there. New players will receive an astounding 100% deposit match up to $€£ 500 + 120 Free Spins on Starburst (for the first 3 deposits). They also offer seasonal promotions which they update monthly. Check out the Calendar to keep up to date on new bonuses. FIRST DEPOSIT -100% BONUS up to $200 + 20 Free Spins. SECOND DEPOSIT - 100% BONUS up to $150. THIRD DEPOSIT - 100% BONUS up to $150. 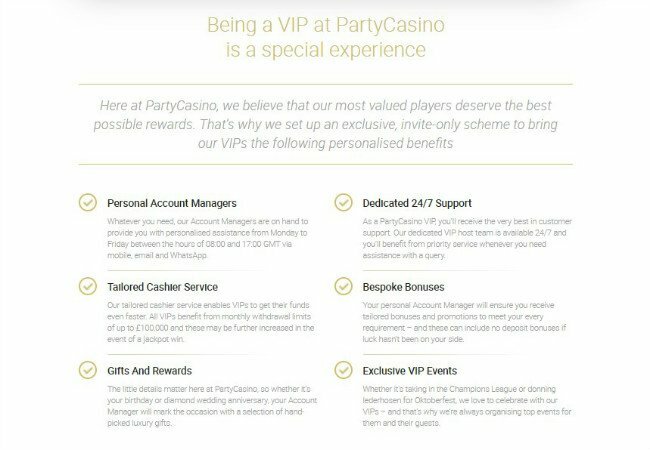 For the most valued players the casino offers a VIP service that includes an account manager, 24/7 support, faster withdrawals, higher withdrawal and deposit limits as well as exclusive promotions and VIP events. Terms for all players excluding UK: 18+. New depositors only. Bonus Expires in 30 days. Spins expire in 3 days. See terms for play-through requirements. Minimum deposit £10. 10x wagering on free spin winnings. Terms for UK players: 18+. New depositors only. UK residents only. Minimum deposit £10. 10x wagering on free spin winnings. Free Spins are valid only on Starburst and expire in 7 days. Excludes deposits made via Skrill, Entropay and Neteller. If your country permits online casinos, then you’re bound to find a convenient and safe payment method with Party Casino. Their interface allows users to select their country, and then automatically displays a list of viable payment options available where you live. Players from Germany, Canada, the Netherlands, United Kingdom, Russia, Denmark, Australia, Sweden, Belgium, France, Romania, Austria, Norway, Finland, Switzerland, Greece, Brazil, Spain, Ireland, and Hungary will all find an array of banking choices. Some common payment methods include Skrill, Ukash, Neteller, Entropay, and Visa/Mastercard. Unfortunately, it appears PartyCasino does not accept players from the United States. partycasino.com supports customers internationally via Live Chat, email, and telephone 24 hours a day, 7 days a week. However, Live Help is available only for Real Money users. Similar to when downloading the software, when I contacted their Live Chat customer support, it took a little while to connect. Once I heard back from an agent, they immediately helped sort out any questions. I just joined Party Casino and I received 50 free spins! wooohooooo!!! !